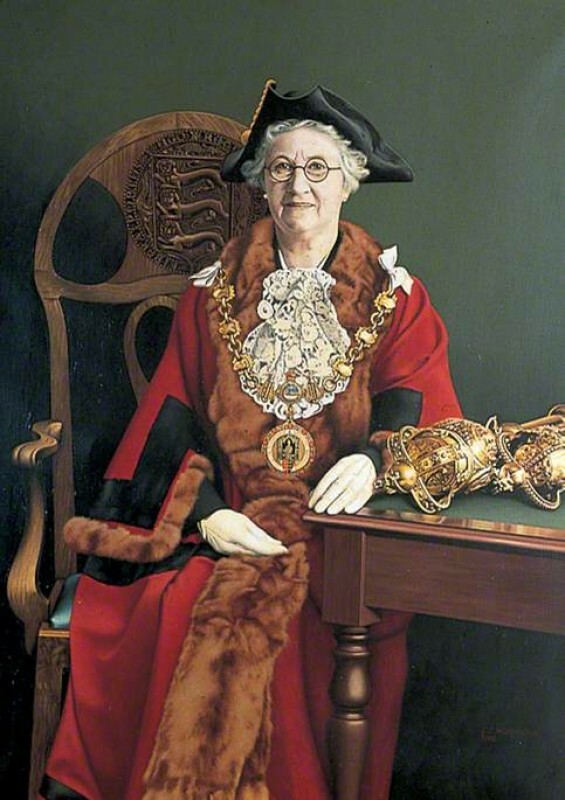 Faversham Town Council wanted to know whether their portrait of the first female Mayor of Faversham, Florence Emily Graham, was by the artist Fred Woodington. The Art Detectives began with genealogical searches into Fred Woodington, initially discovering little about the man but that his brother, Walter Percy Woodington (1916–2000), was a portraitist. Walter Woodington's work is in public collections, and can be seen on Your Paintings. An accomplished portrait, it seemed surprising that, as Osmund Bullock said, 'someone so obviously technically skilled had left so little record of their artistic existence.' Was this painting in fact by Fred's brother? A clue from Tim Williams, who found out that Frederick was also the name of Fred and Walter's father, and that Walter had been Curator of the Royal Academy schools for many years, set Osmund on the right track. Frederick Christopher Woodington was born in East Ham in November 1904 and died in Faversham in 1982. Between 1962 and 1976, he describes himself in his telephone directory listing as 'artist'. However, there was no record elsewhere to support this. Frederick Senior was a butcher, like his brothers and father before him; art was the chosen profession of both his sons but was this portrait by the much older sibling, of whom so little is known, or the younger, with his clearly documented reputation? Editor’s note: this change will appear on the Your Paintings website by the end of November 2014. Did Faversham artist Fred Woodington paint this portrait of 'Florence Emily Graham, Mayor'?